Harold and Maude is a 1971 American romantic dark comedy drama directed by Hal Ashby and released by Paramount Pictures. It incorporates elements of dark humor and existentialist drama, with a plot that revolves around the exploits of a young man named Harold (played by Bud Cort) intrigued with death. 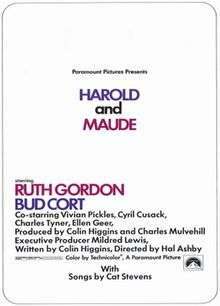 Harold drifts away from the life that his detached mother (Vivian Pickles) prescribes for him, and slowly develops a strong friendship, and eventually a romantic relationship, with a 79-year-old woman named Maude (Ruth Gordon) who teaches Harold about living life to its fullest and that life is the most precious gift of all. Critically and commercially unsuccessful when originally released, the film developed a cult following and in 1983 began making a profit. The film is ranked number 45 on the American Film Institute's list of 100 Funniest Movies of all Time and was selected for preservation in the National Film Registry of the Library of Congress in 1997, for being "culturally, historically or aesthetically significant". The Criterion Collection special edition Blu-ray and DVD were released June 12, 2012. Harold Chasen (Bud Cort) is a young man obsessed with death. He stages elaborate fake suicides, attends funerals and drives a hearse, all to the chagrin of his socialite mother (Vivian Pickles). At another stranger's funeral service, Harold meets Maude (Ruth Gordon), a 79-year-old woman who shares Harold's hobby of attending funerals. He is entranced by her quirky outlook on life, which is bright and excessively carefree in contrast with his morbidity. The pair form a bond and Maude slowly shows Harold the pleasures of art and music (including how to play banjo), and teaches him how to "[make] the most of his time on earth". Meanwhile, Harold's mother is determined, against Harold's wishes, to find him a wife. One by one, Harold frightens and horrifies each of his appointed dates, by appearing to commit gruesome acts such as self-immolation, self-mutilation and seppuku. As they become closer, their friendship soon blossoms into a romance and Harold announces that he will marry Maude, resulting in disgusted outbursts from his family, psychiatrist, and priest. Maude's 80th birthday arrives and Harold throws a surprise party for her. As the couple dance, Maude tells Harold that she "couldn't imagine a lovelier farewell". Confused, he questions Maude as to her meaning and she reveals that she has taken an overdose of sleeping pills and will be dead by morning. She restates her firm belief that eighty is the proper age to die. Harold rushes Maude to the hospital, where she is treated unsuccessfully and dies. In the final sequence, Harold's car is seen going off a seaside cliff but after the crash, the final shot reveals Harold standing calmly atop the cliff, holding his banjo. After gazing down at the wreckage, he dances away, picking out on his banjo Cat Stevens' "If You Want to Sing Out, Sing Out". Ruth Gordon as Dame Marjorie "Maude" Chardin, a 79-year-old free spirit who wears her hair in braids. Maude believes in living each day to its fullest, and "trying something new every day". Her view of life is so joyful that, true to the film's motif, it crosses a blurred, shifting line into a carefree attitude toward death as well. We know little of her past, but learn that as a young woman she lived in pre-war Vienna, was once married and has a Nazi concentration camp tattoo on one arm. Bud Cort as Harold Parker Chasen, a young 18-year-old man who is obsessed with death. He drives a hearse, attends funerals of strangers and stages elaborate fake suicides. Through meeting and falling in love with Maude, he discovers joy in living for the first time. Vivian Pickles as Mrs. Chasen, Harold’s opulently wealthy mother, is controlling, snooty and seemingly incapable of affection. Hoping to force him into respectability, Mrs. Chasen replaces Harold's beloved hearse with a Jaguar (which he then converts to a miniature hearse) and sets up several blind dates, or more accurately, "bride interviews" with young women. Cyril Cusack as Glaucus, the sculptor who makes an ice statue of Maude and lends them his tools to transport a tree. Charles Tyner as General Victor Ball, Harold's uncle who lost an arm in the war and now pulls a hidden cord to make his wire prosthetic "salute". At Mrs. Chasen's request, he attempts to prepare Harold to join the armed forces. The effort is thwarted by a planned stunt in which Harold appears to kill Maude. Ellen Geer as Sunshine Doré, an actress, Harold’s third blind date. She mimics his suicide, giving a histrionic rendition of Juliet's death scene. Judy Engles as Candy Gulf, Harold's first blind date, whom he scares off by apparently setting himself on fire. Shari Summers as Edith Phern, Harold's second blind date, whom he dissuades by pretending to cut off his hand. Tom Skerritt (credited as "M. Borman") as the Motorcycle Officer who stops Maude and Harold. Director Hal Ashby appears in an uncredited cameo, watching a model train at an amusement park. The amusement park is Santa Cruz Beach Boardwalk (California USA) / Penny Arcade. UCLA student Colin Higgins wrote Harold and Maude as his master’s thesis. While working as producer Edward Lewis' pool boy, Higgins showed the script to Lewis's wife, Mildred. Mildred was so impressed that she got Edward to give it to Stanley Jaffe at Paramount. Higgins sold the script with the understanding that he would direct the film but he was told he wasn't ready, after tests he shot proved unsatisfactory to the studio heads. Ashby would only commit to directing the film after getting Higgins' blessing and then, so Higgins could watch and learn from him on the set, Ashby made Higgins a co-producer. Higgins says he originally thought of the story as a play. It then became a 20-minute thesis while at film school. After the film came out, the script was turned into a novel then a play, which ran for several years in Paris. Ashby felt that Maude should ideally be European and his list of possible actresses included dames Peggy Ashcroft, Edith Evans, Gladys Cooper and Celia Johnson as well as Lotte Lenya, Luise Rainer, Pola Negri, Minta Durfee and Agatha Christie. Ruth Gordon indicated that in addition she heard that Edwige Feuillere, Elisabeth Bergner, Mildred Natwick, Mildred Dunnock and Dorothy Stickney had been considered. For Harold, in addition to Bud Cort, Ashby considered all promising unknowns, Richard Dreyfuss, Bob Balaban and John Savage. Also on his list were John Rubinstein, for whom Higgins had written the part and then up-and-coming British pop star Elton John, whom Ashby had seen live and hoped would also do the music. Anne Brebner, the casting director, was almost cast as Harold's mother, when Vivian Pickles was briefly unable to do the role. When Harold and Maude are talking candidly at her home he tells her that he has "died a few times". He describes how, when he was at boarding school, he set his chemistry lab on fire and escaped through a hole in the floor, going home believing his school career was at an end and he was free. When the police came to his house, Harold watched as they told his mother that he had died in the fire and saw her collapse into the policemen's arms. As he reaches this part of the story, Harold bursts into tears and declares, "I decided then I enjoyed being dead". Throughout the movie, Harold "dies" seven to eight times. He tells his psychologist at one early juncture that he has made similar attempts, in all fifteen times now, which he calls a rough estimate. Hanging himself in opening scene: Harold hangs himself while his mother is on the phone. She barely seems to notice this display (at one point she tells him, "I suppose you think that's very funny, Harold.") and continues her conversation. Letting his mother find him in her bathtub, throat and wrists slit and the mirrors drenched in blood: After this act, Harold sees a psychiatrist. Floating dead in pool: Harold floats face down, fully clothed, for an impossibly long time as his mother swims laps past him. Camera shots from below establish that he has no breathing apparatus. Shooting himself in the forehead: As his mother reads the questionnaire for the dating service (and answers it according to her preferences, not his), Harold surreptitiously loads a revolver with live rounds, then wheels around and points it at his mother. When after several moments she still does not notice, he turns around and shoots himself. As the blast sends him toppling backward with a hole in his forehead, his mother snaps, "Harold! Please!" and calmly continues with the questionnaire. Self-immolation: For the first blind date, Harold sets himself on fire on the diving board in view of the horrified girl, then calmly walks in behind her, with his body still apparently burning outside the window. Hand chopping: The second blind date ends abruptly, with Harold chopping off an obviously fake hand. This is the incident that makes his mother decide to send him to the military. Seppuku: For the final date, Harold disembowels himself with a Japanese Tantō knife. Instead of running off like the other dates, Sunshine Doré, a would-be actress, assumes that the act was staged and eagerly joins him. Reciting lines from Romeo and Juliet, she tests Harold's blade with one hand to see its retraction and then plunges it into her chest, acting out her own death scene. At that instant, Harold's mother enters and seeing what she presumes is dead woman on the floor, declares indignantly, "Harold! That was your last date"! Car wreck: Grief-stricken over Maude's death, Harold drives his Jaguar hearse recklessly up a winding dirt road, sending it flying off a cliff to the rocks below. When the camera tilts from the wreckage up the cliff face, we find Harold standing at the top. He calmly begins to play the banjo Maude gave him and slowly dances away. Harold and Maude received mixed reviews, with several critics being offended by the film's dark humor. Roger Ebert, in a review dated January 1, 1972, gave the film 1 and a half out of 4 stars. He wrote, "And so what we get, finally, is a movie of attitudes. Harold is death, Maude life, and they manage to make the two seem so similar that life's hardly worth the extra bother. The visual style makes everyone look fresh from the Wax Museum, and all the movie lacks is a lot of day-old gardenias and lilies and roses in the lobby, filling the place with a cloying sweet smell. Nothing more to report today. Harold doesn't even make pallbearer." Vincent Canby also panned the film, stating that the actors "are so aggressive, so creepy and off-putting, that Harold and Maude are obviously made for each other, a point the movie itself refuses to recognize with a twist ending that betrays, I think, its life-affirming pretensions." The reputation of the film has increased greatly; Rotten Tomatoes, which labeled the film as "Certified Fresh", gave it a score of 86% based on 42 reviews, with an average score of 7.6/10. A consensus on the site read, "Hal Ashby's comedy is too dark and twisted for some, and occasionally oversteps its bounds, but there's no denying the film's warm humor and big heart." In 2005, the Writers Guild of America ranked the screenplay #86 on its list of 101 Greatest Screenplays ever written. Sight & Sound magazine conducts a poll every ten years of the world's finest film directors, to find out the Ten Greatest Films of All Time. This poll has been going since 1992 and has become the most recognised poll of its kind in the world. In 2012, Niki Caro, Wanuri Kahiu and Cyrus Frisch voted for "Harold and Maude". Frisch commented: "An encouragement to think beyond the obvious!" On June 12, 2012, The Criterion Collection released Harold and Maude for Region 1 on DVD and Blu-ray, both of which includes a collection of audio excerpts of director Hal Ashby from January 11, 1972 and of screenwriter Colin Higgins from January 10, 1979, a new video interview with Yusuf/Cat Stevens, a new audio commentary by Ashby biographer Nick Dawson and producer Charles B. Mulvehill, and a booklet which includes a new film essay by film and television critic Matt Zoller Seitz. Exclusive to the Blu-ray edition are a new digital restoration of the film with uncompressed monaural soundtrack and an optional remastered uncompressed stereo soundtrack. Other exclusives are a New York Times profile of actress Ruth Gordon from 1971, an interview from 1997 with actor Bud Cort and cinematographer John Alonzo, and an interview from 2001 with executive producer Mildred Lewis. In June 2008, AFI revealed its "Ten Top Ten"—the best ten films in ten "classic" American film genres—after polling over 1,500 people from the creative community. Harold and Maude was acknowledged as the ninth best film in the romantic comedy genre. 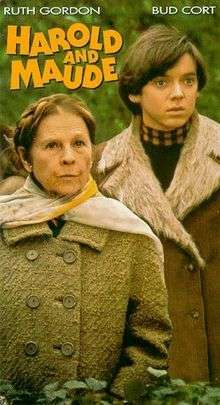 At the 29th Golden Globe Awards, Bud Cort and Ruth Gordon received a nomination for Best Actor and Best Actress in a Musical or Comedy film, respectively. The music in Harold and Maude was composed and performed by Cat Stevens. He had been suggested by Elton John to do the music after John had dropped out of the project. Stevens composed two original songs for the film, "Don't Be Shy" and "If You Want to Sing Out, Sing Out" and performed instrumental and alternate versions of the songs "On the Road to Find Out", "I Wish, I Wish", "Miles from Nowhere", "Tea for the Tillerman", "I Think I See the Light", "Where Do the Children Play?" and "Trouble" which were either on the album Mona Bone Jakon or Tea for the Tillerman. Those albums had been released before the film. "Don't Be Shy" and "If You Want to Sing Out, Sing Out" were not released on an album, until his 1984 compilation Footsteps in the Dark: Greatest Hits, Vol. 2. There is some additional non-Cat Stevens music in the film. "Greensleeves" is played on the harp during dinner. During the scene where Harold is floating face-down in the swimming pool, the opening bars of Tchaikovsky's Piano Concerto No. 1 are heard. A marching band is also heard playing a John Philip Sousa march outside the church following a funeral. The first soundtrack was released in Japan in 1972 on vinyl and cassette, (A&M Records GP-216). It omitted the two original songs and all instrumental and alternate versions of songs and was generally composed of re-released material that was in the film, along with five songs that were not in the film. The second soundtrack was released in December 2007, by Vinyl Films Records, as a vinyl-only limited-edition release of 2,500 copies. It contained a 30-page oral history of the making of the film, the most extensive series of interviews yet conducted on Harold and Maude. Colin Higgins later adapted the story into a stage play. The original Broadway production, starring Janet Gaynor as Maude and Keith McDermott as Harold, closed after four performances in February 1980. Higgins expressed interest in 1978 about both a sequel and prequel to Harold and Maude. The sequel, Harold's Story, would have Cort portray Harold's life after Maude. Higgins also imagined a prequel showing Maude's life before Harold, Grover and Maude had Maude learning how to steal cars from Grover Muldoon, the character portrayed by Richard Pryor in Higgins' 1976 film Silver Streak. Higgins wanted Gordon and Pryor to reprise their roles. 1 2 After 12 Years, a Profit For 'Harold and Maude' By ALJEAN HARMETZSpecial to The New York Times. New York Times (1923-Current file) [New York, N.Y] 08 Aug 1983: C14. ↑ Peary, Danny (1981). Cult Movies. Delta Books. ISBN 0-517-20185-2. ↑ National Film Registry list of films 1989-2006. Library of Congress. Retrieved 2011-09-08. ↑ "Harold and Maude; Criterion Collection". 1 2 Bozzola, Lucia. "Harold and Maude > Overview". Allmovie. Retrieved 8 March 2010. ↑ Dawson, Nick (2009). Being Hal Ashby : life of a Hollywood rebel. University Press of Kentucky. pp. 120–121. ISBN 9780813125381. ↑ Up From the Underground Harold; Maude; Wilson, John M. Los Angeles Times (1923-Current File) [Los Angeles, Calif] 14 Apr 1978: g14. ↑ Gordon, Ruth (1986). My Side: The Autobiography of Ruth Gordon. D.I. Fine. p. 392. ISBN 9780917657818. ↑ Brebner, Anne (guest); Morrison, John (Host) (May 6, 2011). Aspect Ratio - April 2011. blip.tv. Retrieved 2011-09-08. ↑ Ebert, Roger (January 1, 1972). "Harold and Maude". Chicago Sun-Times. Retrieved 2011-09-08. ↑ "Screen: 'Harold and Maude' and Life: Hal Ashby's Comedy Opens at Coronet; Ruth Gordon, Bud Cort Star as Odd Couple", New York Times review by Vincent Canby, December 21, 1971. Copyright © 1971 The New York Times Company. ↑ "Harold and Maude". Rotten Tomatoes. Flixster. Retrieved 2010-10-20. ↑ Savage, Sophia (February 27, 2013). "WGA Lists Greatest Screenplays, From 'Casablanca' and 'Godfather' to 'Memento' and 'Notorious'". Retrieved February 28, 2013. ↑ "Harold and Maude (1971)". The Criterion Collection. The Criterion Collection. Retrieved 17 August 2015. ↑ Atanasov, Svet (26 May 2012). "Harold and Maude Blu-ray Review". Blu-ray.com. Blu-ray.com. Retrieved 17 August 2015. ↑ Katz, Josh (16 March 2012). "Criterion Blu-ray in June: Chaplin, Ashby, Boyle, Soderbergh, Hitchcock, Inagaki". Blu-ray.com. Blu-ray.com. Retrieved 17 August 2015. ↑ 100 Years, 100 Passions. American Film Institute. Retrieved 2011-09-08. ↑ "Empire's 500 Greatest Movies of All Time". imdb.com. 2011-08-21. ↑ "AFI's 100 Years...100 Passions" (PDF). American Film Institute. Retrieved 2016-08-06. ↑ "AFI's 100 Years...100 Cheers" (PDF). American Film Institute. Retrieved 2016-08-06. ↑ "AFI's 10 Top 10: Top 10 Romantic Comedy". American Film Institute. Retrieved 2016-08-06. ↑ Actor In A Leading Role - Musical Or Comedy. TheGoldenGlobes.com. Retrieved 2011-09-08. ↑ Chalifour, Annik (2008-10-21). "Viola Léger: de la langue de la Sagouine à celle de Musset". L'Express d'Ottawa (in French). Retrieved 2016-08-08. ↑ "Roy Dupuis" (in French). ICI Radio-Canada Télé. Retrieved 20 November 2014. ↑ Beck, Marilyn (August 6, 1978). "Higgins eyes 'Harold's Story'". Pacific Stars and Stripes. p. 16. Retrieved 2014-01-30.